On January 8th, 2000, my husband Marvin and I set off on a journey. We left our home in Ohio and headed towards Michigan. After several stops and picking up a few bunnies along the way, we got to the home of Jackie from The Warren House Rabbit Sanctuary. 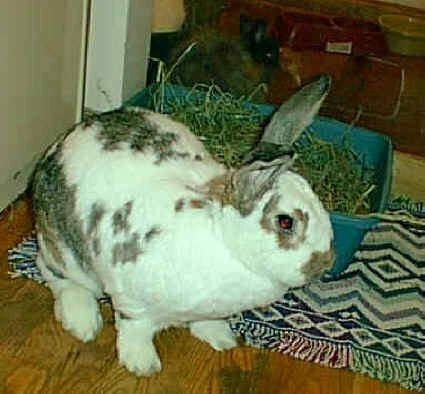 Jackie had rescued a Flemish Giant named SweetPea. He was 4 years old, neutered and declawed. Just so you know, rabbits should NEVER be declawed so I am amazed that a vet actually agreed to do this. 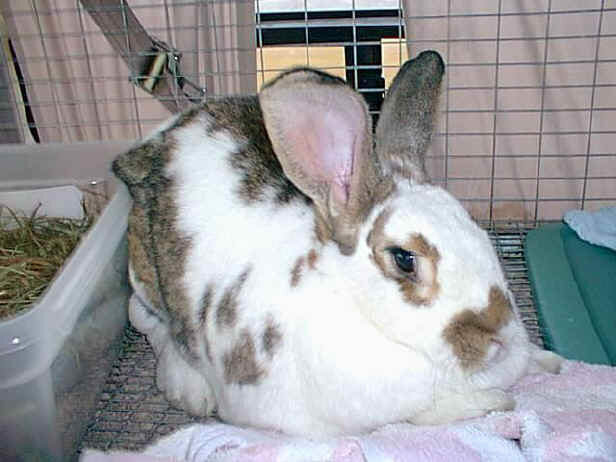 SweetPea had very unusual coloring for a Flemish Giant so there must have been some recessive gene that popped up with him or someone was doing back yard breeding. 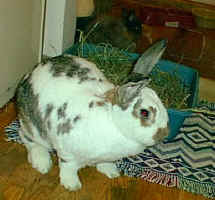 SweetPea has already lived in 2 homes so far but we were going to be his final home. 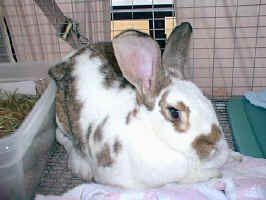 His first owners got rid of him because he chewed cords (Duhhh!) and his second owners just didn't want him anymore. SweetPea was a real doll. It took him some time to settle in and become bonded with other bunnies but he lived very happily with Dazzle, Casper, Big Bunny and Daffy. The main problem we had with SweetPea is he seemed to always drag himself through the urine and got it all over his fur on his bottom. 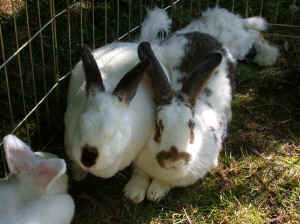 Although he lived with 4 other bunnies that were all white, they never got messed up the way he did. Every now and then, he needed to be bathed and trimmed to really get his fur cleaned up. SweetPea weighed about 15 pounds. This is SweetPea being bathed outside on a nice day. Update: Along with the other bunnies, SweetPea also got sick. She had some drainage from her eye, was pee soaked, had severe head tilt and had gotten incredibly thin. We had her on 3 different meds and she was continuing to get worse and I just couldn't stand to see her suffer anymore so on 10/3/02, I helped her make her journey to the bridge. 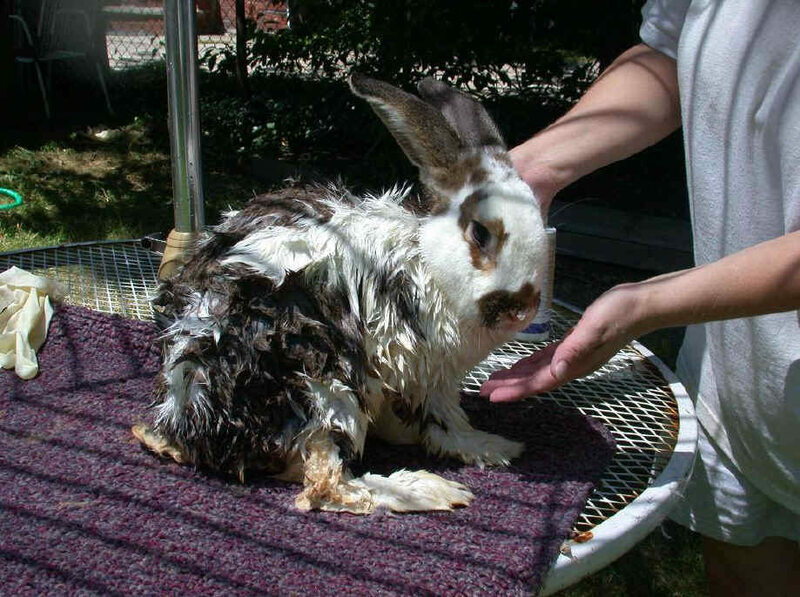 To find out how this story continues, click here to read Big Bunny's page or click here to read the story of Mycotoxin poisoning.